College of Law has raised $ 53,679 from 83 gifts! In order for us to grow and achieve our goals, we need your support now more than ever. With a decrease in State funding, private support has become essential for us to continue providing a quality legal education at an affordable price. Gifts to the Dean’s Fund address the College’s most pressing needs and help us take advantage of opportunities for learning and service to legal education. Gifts can be used to augment and solidify academic programs, purchase materials and equipment, and support faculty and student scholars. With the average national law school student loan debt over $110,000 for three years, scholarship support is our focal point. WVU law students graduate with $30,000 less student loan debt than the national average. This is made possible by providing financial support through scholarships to over 70% of our students, resulting in nearly $3 million awarded annually. Since its founding in 1976-77, the Clinical Law program has provided more than 600,000 hours of pro bono legal service to over 2,000 clients. The program has helped train more than 1,000 students to be client-ready. This year, the National Jurist rated us second in the country for greatest community impact because of the 40,000 hours of pro bono legal services provided by our clinics. 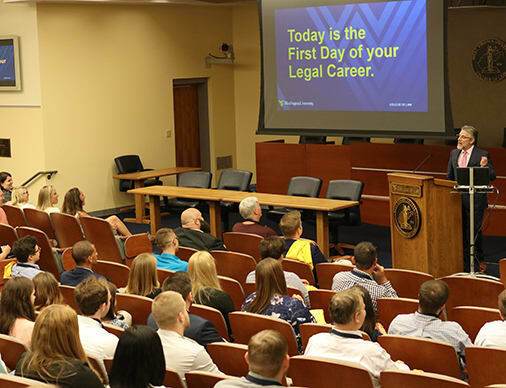 WVU Law offers clinical law opportunities in 9 areas: General Practice; Child and Family Advocacy with Medical-Legal Partnership; Entrepreneurship and Innovation; Immigration; Innocence Project; Taxpayer Advocacy; Land Use and Sustainable Development; United States Supreme Court; and Veterans Advocacy. The College of Law visiting committee will match every dollar donated to the Dean's Fund up to a total of $11,000. The first 50 gifts made to the College of Law on Day of Giving will unlock a $2,500 donation from Dean Bowman. Help the law school meet this challenge by making your donation today!